Marvel said that they were going to include every Spider-Man possible in the Spider-Verse event. 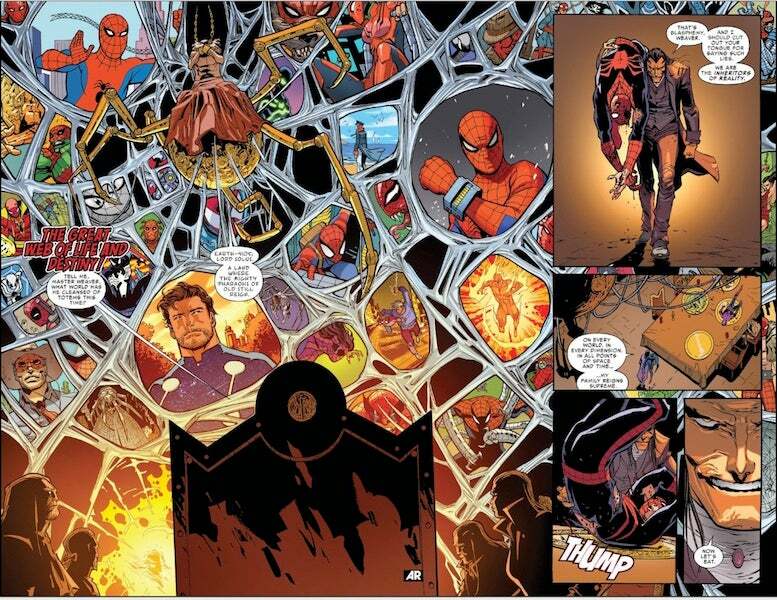 From today’s “Amazing Spider-Man #9,” which officially launches the Spider-Verse event, fans received a look at even more Spider-Men who would join the multiversal fight against Morlun. When Morlun confront the Great Weaver Spider-Diety, she spins a web that reveals the Spider-Men who belong to its Great Web of Life and Destiny. But the Great Web has a lot of obscurities in it. Of the various Spider-Men included in web, many are rarely-seen versions of the character. It even looks like Marvel has thrown some new Spider-Men into mix, mashing up Peter Park with other Marvel--and DC--characters. Locating all of the Spider-Men was certainly a lot of work for Spider-Man editor Nick Lowe, who poured over hundreds of Spider-Man comics in preparation. "We tried to help all of them make the cut, where space will allow. There are so many coming, your head is going to spin," Lowe told Comicbook.com "But the ones who have the largest roles were chosen very carefully both for their importance to Spidey-fans and the different character elements that we needed. And then just Slott’s favorites." When asked if he had a favorite out of the dozens of new characters, Lowe's choice was simple: Spider-Gwen, the breakout character from "Edge of Spider-Verse #2" who was just awarded her own series. "Spider-Gwen is the obvious answer, right? Aside from that SP//dr is a fave. You’ll see both through Spider-Verse! And Olivier created a Spider you’ll first see in ASM #10 who is really awesome, too," he revealed. To help you better grasp the stakes at hand in Spider-Verse, we cracked open our encyclopedia and ID’d as many players possible. 7) Carnage Spider-Man, from the Ultimate Spider-Man television series. 8) Japanese Spider-Man, from the 1970’s TOEI live-action TV series. 9) A Human Torch-powered Spider-Man. 10) The retired, “Grandpa Martin” Spider-Man, featured in a back-up tale from Spider-Man #700. 13 )A Kraven The Hunter/Spider-Man Hybrid. 16) Ashley Barton, from Earth 807128. She is the child of Peter Parker’s daughter and Clint Barton in the “Old Man Logan” universe. 17) Spider-Man Manga, from Earth 2301. 18) Ben Reilly Scarlett Spider, wearing the 90’s hoodie costume. 21) Raw Hide Kid Spider-Man. 24) An Iron Fist/Spider-Man hybrid. 25) An anime-style Spider-Man, possibly from the Ultimate Spider-Man television series. 26) A heavily armored Spider-Man. 28) Spider-Man from 1960s cartoon series. Who did we miss, or misidentify? Let us know in the comments below.